We have the perfect venue for your holiday party, wedding, anniversary, quinceanera, or birthday party! We have 2 spacious ballrooms to accommodate your event. Our smaller ballroom features a 30' x 40' dance floor and our grand ballroom features a 40' x 60' dance floor. Both ballrooms have additional carpeted space around the dance floors for tables and seating. Our grand ballroom has kitchen space for food, set-up and storage that may be needed, as well as a beautiful bar counter top for food and beverages. 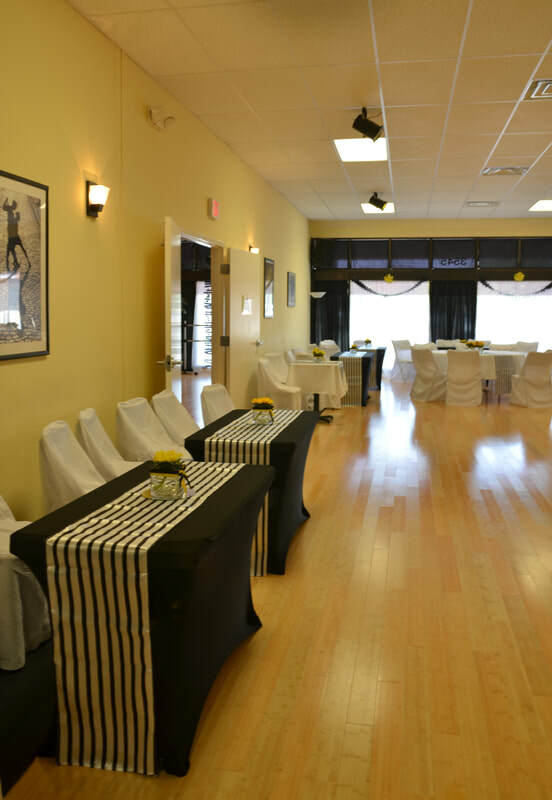 Our smaller ballroom is equipped with long tables for additional storage or set-up. Outside there is ample parking. Our facility is also handicap accessible. If you have further questions about use of our facility, please check out the FAQs section, or call and speak to one of our studio owners. If you book your wedding reception at our facility, you will receive 10% off a package of 3 private dance lessons for your special day!